I got to know Salvatore Ambrosi a lot better in Beijing earlier in the year, when we were both at the Brio store for events. He had a strong response among customers there, which was good to see – including the odd customer ordering a full wardrobe of trousers, which we know is often what keeps bespoke makers going. I admire Salva’s work ethic. He was coming off three weeks of travel around Asia when we met in China, and it was starting to show. Being away for that long is never easy – even if you’re effectively visiting friends. 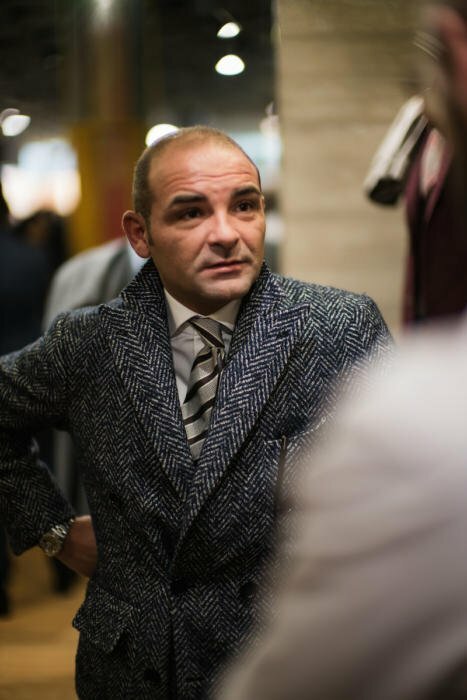 I’ve met enough second-generation Italian artisans, taking over a business their father created, to know that Salva’s work ethic is not the norm. He reminds me of Elia Caliendo in that way, who if anything is taking the quality and ambition of the business to another level than his father’s generation. It’s also an Italian thing, and particularly a Neapolitan thing. I can say that because Italians say Italians they’re bad, and Neapolitans say Neapolitans are the worst. Ambrosi trousers are expensive, starting at £800. But believe it or not I think that’s cheap for what they are. 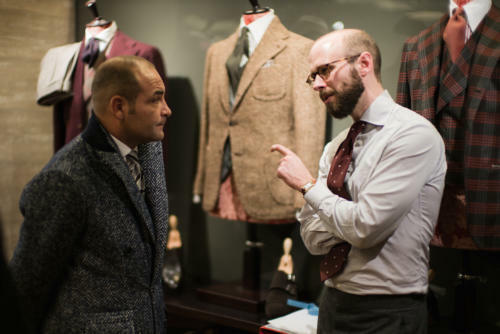 A good bespoke suit (say £4000) will effectively cost £1000 for the trousers. It’s one reason that good RTW or MTM trouser options, such as those at the Anderson & Sheppard haberdashery, are often so popular. None of those trousers will be made with as many hand details as Ambrosi ones either. Those details are, admittedly, largely decorative – no trousers need quite that many tack stitches, no matter how hard you wear them. 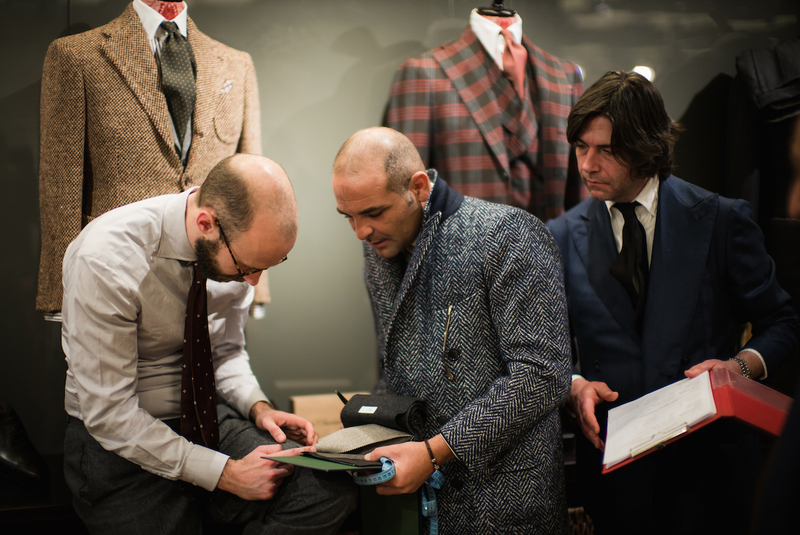 But as with many things – like Cifonelli suits or D’Avino shirts – it’s about buying the finest of the genre. 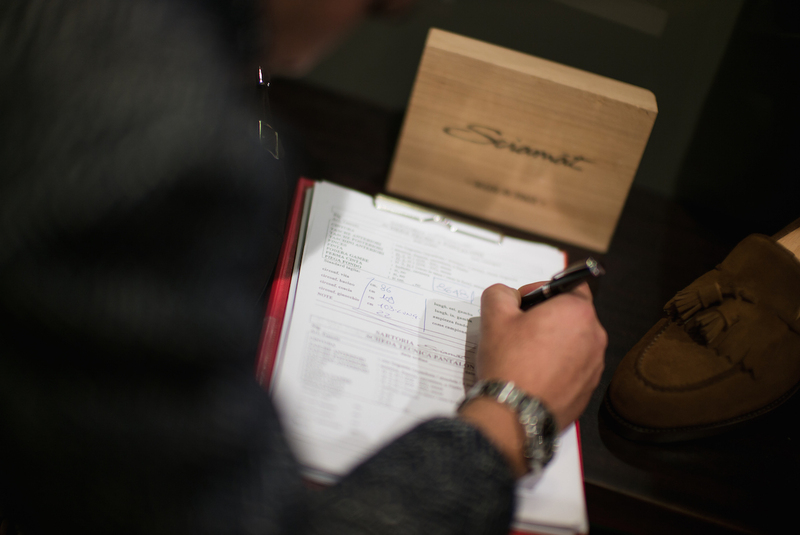 You can follow the discussion on Salvatore Ambrosi bespoke trousers – in London by entering your email address in the box below. You will then receive an email every time a new comment is added. These will also contain a link to a page where you can stop the alerts, and remove all of your related data from the site. Valentino is either listening very intently or trying to sell you on Sciamat – did you commission anything Simon? What’s your opinion on Sciamat? Their cut is very original, and their pieces have great handwork but…the cut? I agree with Nestor – would love to hear your thoughts on Sciamat. I’m a big fan of their aesthetic, especially their (Kent-style) DBs: close fit, large upswept lapels, and usually with a spalla camicia. I do like your blog even if my personal style preferences seem to differ dramitically from yours. But that is not important and keep finding inspiration while following your work. However, your statement about italian work ethic is not even a stereotype it’s worse. It’s humiliating and a disregard towards the big majority of italian artisans. I do have personal experience with lots of them, tailors as well as other artisans and I have experienced and enjoyed highest level of work ethic and noble humility with many of them. I am an Italian living in Austria and Germany and work ethic in those nice countries is surely not superior to that in Italy. Your additional statement about “many Italians” admitting their own lack of ethic makes it even worse for me. I am not sure I would write down all stupid things I might hear when listening to “many Germans” or “many British”. You can do better than this. Keep doing it. I thought Simon was commissioning a Sciamat item there for a sec but read the comments. It’d be interesting to see your final commission on Ambrosi. Funnily enough, in the past weeks I had been thinking about what you might say of Salvatore Ambrosi’s trousers. So I’m delighted you have decided to send a post dedicated to this House. From my perspective, I think their trousers are most effective for those who are not suits wearers, but who are interested in high end trousers that could match equally high end jackets (blazers). 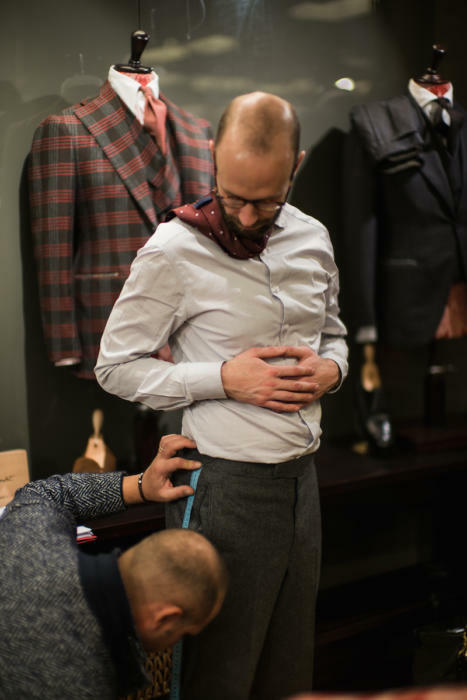 If Naples were like Turin (Northern industrial) the artisnal tailoring culture may well have disappeared. Geography aside, I love Salvatore’s herringbone coat, could you provide any detail Simon? Yup. Forget the trousers, that herringbone jacket is pretty sweet. I’d like details too, just to know. I wouldn’t be able to wear it, doesn’t get cold enough here, but really just wouldn’t be able to pull it off. 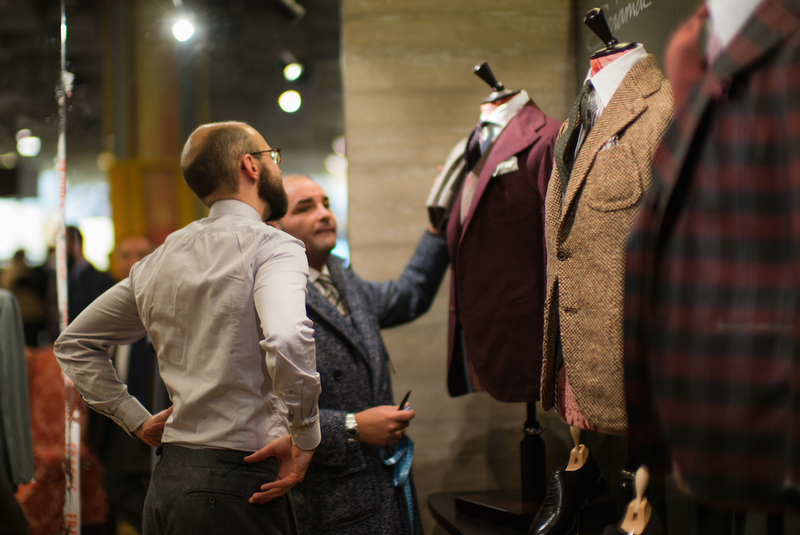 Do you have any experience with Sartoria Formosa? 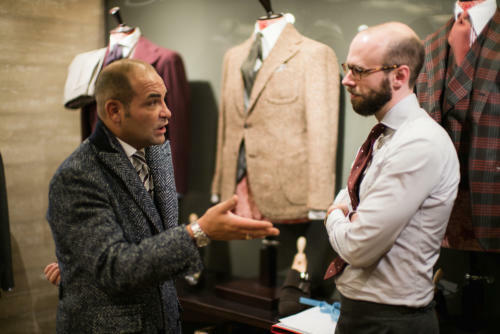 The only sad thing to me – and this is purely a matter of taste – is that each picture i see of Ambrosi is not a positive advert for his trousers which is why i take to task Simon’s opinion that he has a real sense for style. Amrosi is overpriced and not better then Pasquale mola or anticosartoria leonardi. His trousers used to be around 400€ , later 600€ back in Napels, then he went on the road and charged 800€, now 1200€. 50% increase over 2 years, whish my salary increased this fast. Shows what iGent-popularity can do for you. Absolutely agree. The same pantalone or even better you can order from Napoletano Sarto for 400-500 euro. These Sarto are also travel. I am thinking about buying a document case from Swaine Adeney (http://www.swaineadeneybrigg.com/store/swaine-adeney/document-cases/westminster-2 – in Dark brown, with a round lock). I am going to have my initials embossed. I think it would be best to have the initials on a place that is hidden when the case is closed. What do you think is the best positioning taking this into account? I would ve really happy for any input! Thanks! That’s a great spot. Quick follow up question: gold or blind embossing? The lock is going to be gold-colored. Is there a final article on the Ambrosi trousers?